Enhanced Abilities: Gudra has super human strength and endurance. Soul Removal: Gudra is capable of extracting the souls of the dead from their bodies. Flight: Gudra has a flying horse called Stormwind. Weapons: Gudra utilises many melee weapons, typically she will have a sword or a spear that can kill with a touch. 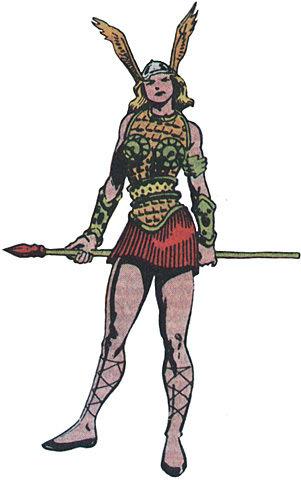 A Valkyrie, Gudra was summoned by Adolph Hitler using the Spear of Destiny in order to join Axis Amerika. She became a member of Axis Amerika a team of costumed agents who engaged in subversive activities in the United States during World War II on behalf of the Axis powers.